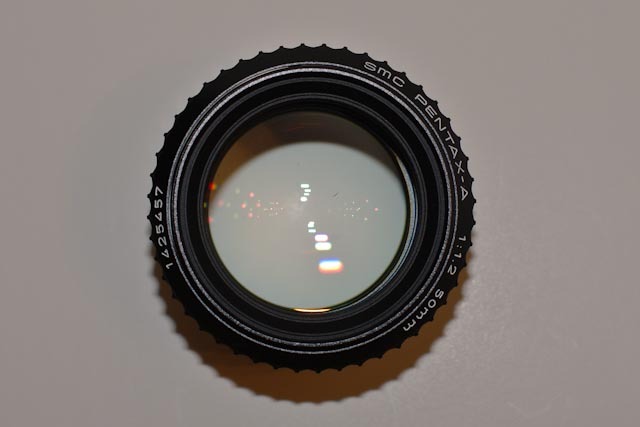 SMC Pentax-A 50mm f1.2 lens. I had heard a lot of praise for this lens, and bought it thinking it would replace my Cosina 1.2; the Pentax 50 is a great lens, but I've decided that I prefer the Cosina after all. I paid quite a bit more for this lens and so at this price I'm taking a pretty good hit, but I'm doing so in the interest of fairness. If you look closely at the last photo, there is a speck inside the lens. When I bought the lens I don't recall seeing this speck, and in all other respects, this lens is in perfect condition, no scratches, dings, fungus or haze. 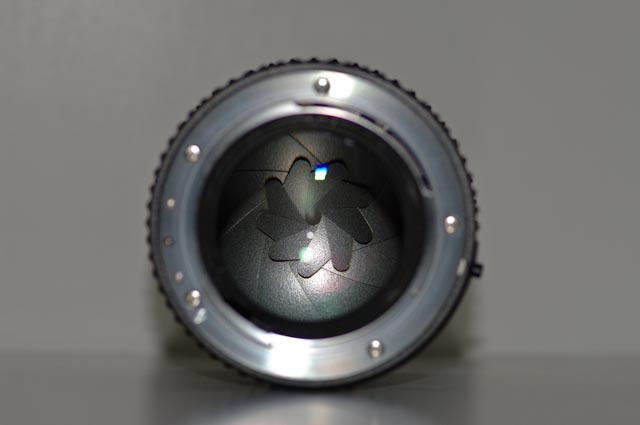 The speck itself appears to be a bit of the black flocking that coats the interior of the lens. It does not seem to affect the image quality though, and in fact I'd say the Pentax is slightly sharper at large apertures than the Cosina. Comes with original Pentax front and rear caps. Also included is a screw-on rubber lens hood (came with the lens), and a metal screw-on lens hood with its own cap; the hood is threaded and will accept 58mm filters. May return within 7 days if item not as described. Buyer pays return shipping. 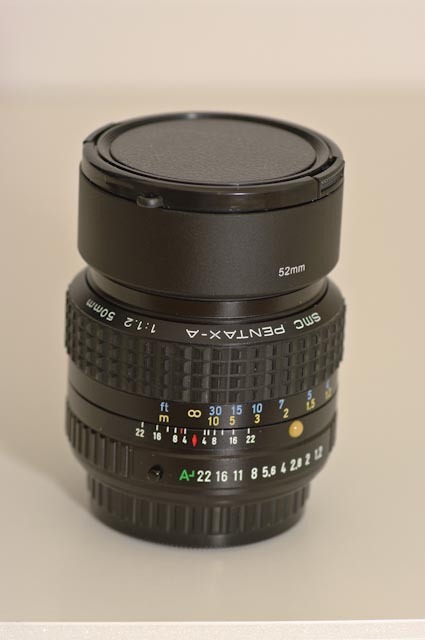 Beauty lens in great shape--I use the same hood & cap on mine too. Hi Farfisa, just trying to work down my kit to the essentials. 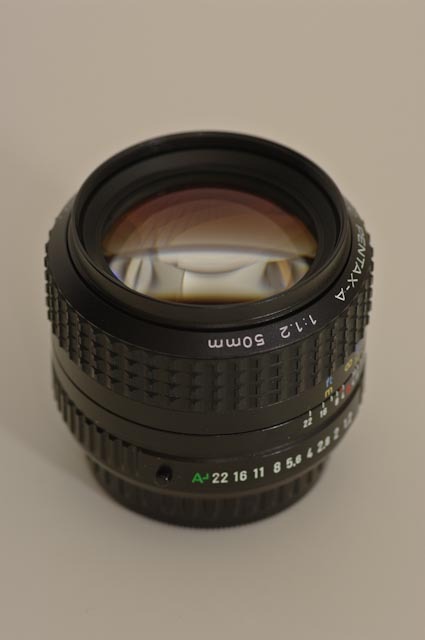 Tried it, very nice lens, but in the end I still like the Cosina better, and it's hard to justify both right now. I can think of a couple others that might go as well. Totally understand trying to keep the kit down--I love trying out different but similar lenses, and always have trouble letting one go. I've just always wanted to make that joke about your screen name--sorry! LOL, yea it had something to do with a (soon to be ex-)wife and a growing enthusiasm for photography! Last edited by NeverSatisfied; 02-06-2011 at 11:25 AM. I did the same thing (no wife involved however) but I let go of the 1.4, the 1.7, and the 2.0 versions (as well as their M counterparts). Good luck with the sale. From what I've seen lately, your price is quite fair.